The term 'haunt,' comes from the same root as 'home.' Typically, a haunted location is the former home of the deceased, or the spot where the deceased died. There is not necessarily a constant pattern to a actual real ghost haunting (A disembodied soul; especially : the soul of a dead person believed to be an inhabitant of the unseen world or to appear to the living in bodily likeness.). Some phenomena manifest themselves periodically or continually over durations that may be short - a matter of days - or long, going on for centuries. Some hauntings occur only on particular or certain specific times "anniversary" dates: A residual haunting is a playback of a past good or bad event. The apparitions involved are not spirits, they are what somme refer to as " astral historic mental recordings" of the event. Not everyone who visits or lives in a reputedly real haunted house will often experience the same phenomena of real spirits ghost or evil demons. Actual hauntings sometimes can be brought to an abrupt end through an actual ritual exorcism conducted either by clergy or by a medium or psychic who reportedly can communicate with the ghost or spirit believed to be responsible for the haunting. Some hauntings end of their own accord for reasons to often unknown. Those haunted places that seem to be 'psychic readings,' or impressions that certain people can receive, do not respond to exorcisms. Such hauntings seem to be endless re-enactments of events. What causes the playback of a haunting or mysterious ghost event, is often ones on conjecture. Is it the right weather conditions, the witness's energy or sensitivity or some type of energy release? That is the question that we as haunted ghost researchers are always trying to answer. It is popularly assumed that most hauntings involve visual apparitions, or ghosts, of the dead. In fact, apparitions are associated with a minority of reported cases. Most hauntings involve noises, such as mysterious footsteps, rustlings, whisperings, animal sounds and howlings, thumps, tapings and rapping's; smells, especially of flowers, perfume, burned wood or rotting flesh or matter; tactile sensations such as a cold prickling of the skin, cold breezes and feelings of being touched by an invisible hand. Some hauntings feature poltergeist activities such as rearranged furniture, stopped clocks, smashed glassware and mirrors, and the paranormal movement of objects. Psychics often experience negative emotions at a haunted site, including anger, fear or hatred. They also may sense a presence of evil. Other hauntings seem to involve friendly or benign ghosts. Some mediums say they can contact trapped spirits of the dead who are haunting sites, and are able to send them on their way to the other side. Some ghost hauntings also feature phantom animals, such as deceased pet dogs, cats, snakes, birds, horses, pigs, hamsters and of course wild animals reflected as wolf, bear or even eagle, jaguar and lion spirit totems of the American and Aboriginal tribes and South American Indians, which are often more so seen, felt or heard in familiar spots. In India and Pakistan several areas or said to be haunted by the many ghost and spirits of monkeys, elephants and tigers. One ghostly frightening encounter of apparitions are of cobras or giant snakes, often many ghost stories surfaces in many areas of these phantom snakes. The tomb of Marie Laveau New Orleans voodoo queen is said to be haunted by her voodoo familiar, snake named Zombi. Objects as well as sites may be haunted. In Great Britain, for example, numerous tales exist of haunted skulls that seem to cause unearthly screaming whenever they are removed from their places in a home. Ebay has seen it's share of haunted antique furniture, paintings , dolls and common house hold appliances and jewelry go up for sale in more recent times. Poltergeist ( pol·ter·geist Pronunciation: 'pOl-t&r-"gist: German, from poltern to knock + Geist spirit: a noisy usually mischievous ghost held to be responsible for unexplained noises (as rappings) hauntings are characterized by very frighteningly violent physical disturbances such as flying and levitating objects, banging doors, disappearing objects and physical assaults on humans. These disturbances often seem to be caused by energy from living persons; there is though some credible evidence that some poltergeists may be actual discarnate spirits. 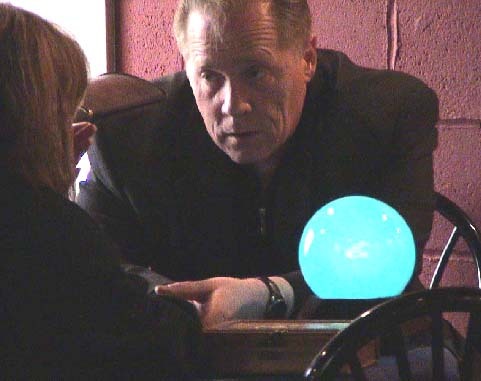 Oxford philosopher Henry Habberly Price and American parapsychologist William G. Roll are among those who have elaborated upon Sidgwick's theory. Price's theory, called "deferred telepathy," posits that there exists a "psychic ether" that is a bridge between mind and matter and impregnates all matter and space. Certain thoughts and events are impressed upon this ether and remain on it for long periods, even years. When tragedies occur, the appropriate psychic conditions are created and lasting impressions result. Sensitive persons coming into contact with a haunted house might telepathically contact these thoughts and emotions which are then "replayed" as hauntings. "Deferred telepathy" has been criticized by others for not explaining movements of objects that are sometimes reported in hauntings. Roll has proposed that all objects have a psi field that pervades and exudes from them. A sensitive individual contacts and reads the impressions of a house from it's psi field during a haunting. This theory had suffered some of the same criticism as Price's theory, particularly since persons who have little or no demonstrable psychic ability have witnessed hauntings. Many leading parapsychologist often have re-studied several hundred cases of hauntings and analyzed their characteristics, relating them to different theories of hauntings and to Spiritistic theory. Bozzano came to five conclusions in support of his belief that hauntings were spirits of the dead: phantoms of the dead can haunt sites where they did not die and had not lived; hauntings consist of telekinetic movement of objects that suggests some type of physical presence; hauntings are associated with deaths to a greater extent than other types of tragedies or emotions; hauntings are intermittent; and when such actions as exorcism and prayers for the dead are preformed, the said actual hauntings stop, recede or actually end. An explanation for at least some real ghost sightings, manifestations or actual hauntings often suggested by many paranormal ghost investigators is that of the "portal theory," an opening to another or often other dimensions that allows spirits or ghost to enter our physical world. Belief in haunted doors or portals is universal. Certain places that have been so deemed sacred quite often serve as natural portals. Wells have often been recognized as natural entryways for spirits to manifest. Other portals can or do so open at places associated with death, such as funeral homes, haunted mansions, morgues, cemeteries, battlefields, public parks, bridges, and natural disaster sites; Often places associated with trauma and intense emotions, such as airports, train stations, hospitals, Jails, court houses, crossroads where accident are frequent, lonely roads in the middle of nowhere, hotels, schools, public highways, churches and theatres; and lonely places such as lighthouses and devastated hurricane and tornado destroyed areas or entire cities. Too numerous or the actual remedies to end hauntings, they do so exist around the world. Some are really simple, such as sweeping out the ghost with a broom, or just asking the offending spirit nicely to leave. Other cures are more elaborate, such as formal Catholic rites of exorcism or ghost removal rituals. Such hard actions or grave measures do not always succeed when performed by a novice. Often most tend to aggravate the situation more if not professionally handled. Hauntings occur with no regularity and for no particular reason. Some weird occurrences may manifest on occasion or even continually for a few days or hundreds of years; others may only occur on certain anniversaries; and others may be totally random. It is generally assumed that hauntings involve apparitions, or ghosts, of the deceased. In fact, apparitions are seldom seen. Most hauntings involve noises like footsteps, a tapping or knocking sound, strange smells, sensations like the cold prickling of the skin, cold breezes, and the feeling of being touched by an invisible hand. Other hauntings involve poltergeist-like activity such as solid objects being moved, broken glass, doors that open and close by themselves, and manipulation of lights and electrical devices. People who visit haunted locations also report a variety of overpowering emotions, including anger and fear. Many cases like this are mistakenly called "evil" or "demonic." Other places seem to involve friendly, or at least harmless, emotions. A variety of phenomena can be connected to poltergeist activity: knocking and tapping sounds, noises with no visible cause, disturbance of stationary objects like household items and furniture, doors slamming, lights turning on and off, fires breaking out, etc. The widely accepted theory behind poltergeist phenomena is that it's usually caused by a person. This person is usually an adolescent girl who is going through an emotionally troubled time. The theory is that this person may be unconsciously manipulating the items in the house by psycho kinesis, which is the power to move things by energy generated in the brain. Kinetic energy remains unexplained, but even mainstream scientists are starting to admit that it may exist. It is unknown why this energy appears in puberty-age girls, but it has been documented. When the activity begins to occur, the girl is usually in the middle of emotional or sexual angst. It is also possible for young boys, and even adults, to manifest this odd ability. The majority have no idea they're causing the activity. The easiest way to explain this type of haunting is to compare it to an old film loop. Imagine an old movie tape is stuck in the VCR and the same clip keeps repeating itself. In locations where these hauntings take place, a powerful event or a series of events may be imprinted on the atmosphere. It can then suddenly pop up and play itself at random. But it's not necessarily visual; they are often replayed as unexplained sounds. The famous "phantom footsteps" reported in many haunted locations are a perfect example of this. This sometimes happens in the case of a murder, traumatic event or unfinished business. At the time of death, the spirit refuses to pass over because of these events. The spirits often linger because of emotions that tie them to the earth, from anger to love. Or perhaps the person does not pass not because they couldn't, but because they did not want to. In other cases, there is the chance the spirit does not even realize they are dead (like Patrick Swayze in Ghost). This can occur when the death is sudden. Chickamauga Battlefield in Northwest Georgia. Site of one of the bloodiest battles of the American Civil War. According to some, Chickamauga is haunted by the ghosts of killed soldiers and a frightening entity known as "Green Eyes"
New Orleans, LA - Numerous sites in this city, especially in the French Quarter, claim multiple hauntings. Lalaurie house, Saint Louis Cemetery number 1. Arnaud's and Brennan's restaurants, the Hotel Monteleone, City Park and Saint Louis Cathedral at Jackson Square, and most of Royal Street are among the French Quarter's most famous haunted sites. Since Hurricane Katrina, many residents report higher paranormal activity than usual. Several buildings located at Church Street Station in Orlando, Florida are reported to be haunted. While the attraction itself has been closed down for a few years, many of the remaining local businesses have moved elsewhere because of the paranormal phenomenon. Church Street Station is now, however, a very popular tourist destination for all local and visiting ghost hunters, parapsychologists, and paranormal enthusiasts.